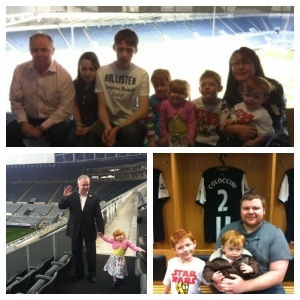 Last year, the whole family decided to book a table at St James' Park for Sunday lunch to celebrate grannie and grandad's birthday. There were 12 of us in total ranging from 1 year old to age 50+. Sunday lunch is available to book in the magpie suite on Sunday's when Newcastle aren't playing at home. It is priced at £16.95 per adult for 3 courses and a reduced price child's menu is also available. The price includes a stadium tour (more about that later). St James' park was a lovely choice for a special family meal. Our table was situated next to a floor to ceiling window with spectacular views over the pitch. The staff were very welcoming towards children and provided them all with NUFC colouring sheets and crayons. Children's meals were only £3.95 which was an absolute bargain. Everybody enjoyed the lunch and before dessert was served we were invited with other diners to enjoy a stadium tour. Our guide was great and kept the tour fun and informative for young and old. Highlights of the tour were us being allowed to film the kids running out of the dug out, sitting pitch side in the manager's seat and being allowed in the players dressing room and seeing all of their shirts hanging up. I really could not recommend St James's park for a special occasion lunch highly enough. It was such a lovely day for all who went and it will be lovely to go back in a few years time when the children are a bit older and will probably enjoy it even more.